What is a sensory break? It is purposefully planned activities that either stimulate or calm the senses – any of them, from visual to motor and everything in between. Also called a sensory diet, these are breaks that cater to the specific sensory input needs a child has to stay focused or organized. In some cases, this will be an overwhelming of the senses by jumping or running, to quiet music to soothe the soul. When you think of it that way, most of us actually enjoy these breaks. Getting up from our desks to stretch in the middle of the work day – guess what, that’s a sensory break. They don’t need to be big and they don’t even need to cost anything. They help all of us feel better, but our kids on the spectrum need these breaks to function. Because no two kids on the spectrum are the same, what works for one child may not work for another – especially since some of those who have tactile challenges may not like some of the breaks that focus on this sense. One idea for a sensory break, is to actually a use a sensory “bin”. In our case it’s a plastic bowl stolen from one of my cupboards. These bins can be filled with anything you find around the house and depending on your child’s needs, they can be a variety of different textures. 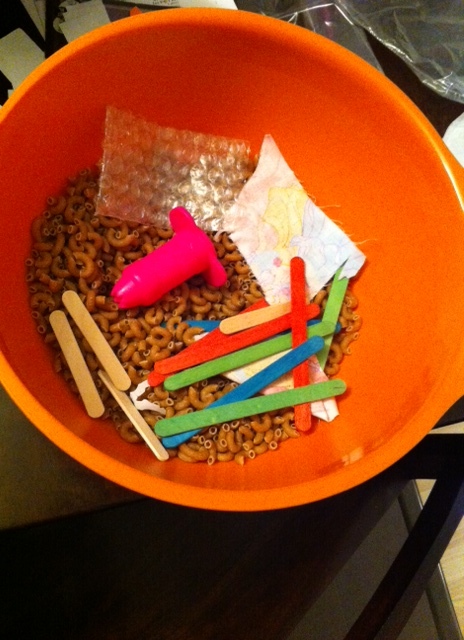 Currently, our bin is filled with uncooked macaroni noodles, popsicle sticks and hard plastic, bubble wrap and some scraps of rough fabric. MJ’s sensory needs are usually things that are either hard – almost painful to touch (and in many cases I often don’t find their touch pleasant) or fleece; she must sleep on fleece and even in fleece when she can, makes summer months a tad difficult. She’s very specific and it’s rare she has a like for anything in between when it comes to touch. Sensory bins can be fun for all kids – regardless of whether they are on the spectrum and besides being used as a break, they can also be a really great teaching tool. For example, since our bin has coloured popsicle sticks, we can ask her to touch or pick out the red popsicle stick and so on. If you can fill your bin with a variety of textures, you can then use it the experience to ask your child to pick out something soft, crinkly etc. to help them learn about the different kinds of textures. The beauty of many of these is that we don’t realize many of these things that kids have done for ages, are actually sensory breaks. The difference is that for our kids on the spectrum – they need these breaks, several of them per day (in our case it’s about 3 per hour) in order to function. For more ideas, check out this great handout from sensorysmarts.com. What’s your favourite sensory break activity?